Thailand manufactures 25% of the world's hard drives, and the severe 2011 monsoon season floods affected some of its largest industrial parks, where many hard drive manufacturers and component suppliers are located, causing worldwide shortages and price increases. Between October 15th and 21st, water penetrated the Bang Pa-in Industrial Park, the Navanakorn Industrial Park (the largest of its kind in Thailand), and the Bangkadi Industrial Park. All of Western Digital's and Toshiba's manufacturing sites in Thailand were located in these 3 parks. All of them have been rendered inoperable. Large-scale data center operators who are currently growing very rapidly with a focus on storage must be financially impacted by the situation. I thought of Amazon Web Services and, sure enough, one of my favorite tech bloggers James Hamilton (vice president on the AWS team) wrote an insightful post entitled Serious Hard Drive Shortage Expected for at Least 2 Quarters. "Higher drive and component prices will persist into the summer months of 2012" Yikes! It turns out that if you need a HDD it is much cheaper to buy it as an external HDD right now. externe harde schijf wrote: Here in Holland prices are increasing but nobody knows why. HD-$cam wrote: "All of Western Digital's and Toshiba's manufacturing sites in Thailand were located in these 3 parks"
and, All the other HD manuf's are just along for the $$$ ride. ..., Outsourcing, unbelievably cheap slave labour, and cheap "corporate" taxes, caused this very "avoidable" mess - don't blame it on the weather. They put ALL their proverbial eggs in one basket, but now, expect us all to bail them out. If you possibly can, DO NOT BUY any Harddrives for now. 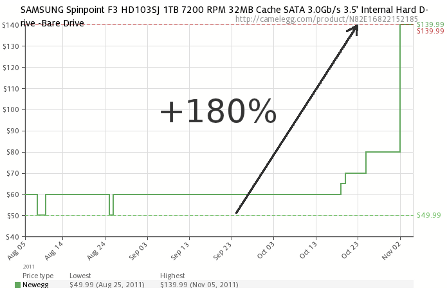 Unless SSD's can match this pre-moneygrab HD prices. ? TC wrote: thanks for the blog. I was wondering myself. I went on a external HD purchase spree in second quarter 2011.
toshiba USB 3.0 - 2 TB for $70 after instant rebate. I loaned a friend one and was going to buy him one for christmas.. and looked and the USB 2.0 - 500 gig is now over the price for a 2 tb 2 months ago. Needless to say.. I just said hold onto my loaner one.